It's no secret that I am a huge fan of Leapfrog learning DVDs. I partially credit them with how advanced Jake is in his reading. We own all the previous DVDs, so when we had an opportunity to review the first new release in years, we were more than happy to accept. 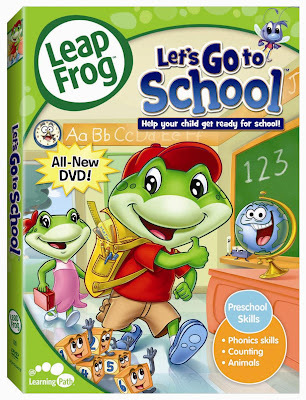 LeapFrog: Let's Go to School was officially released on August 18th, 2009. 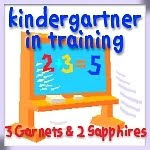 It is perfect for children who are starting preschool or kindergarten this fall, who might be feeling nervous because they do not know what to expect. This is exactly how the twins Tad and Lily felt in the DVD. Their worries were put to rest after a tour of their new classroom the day before school started. Tad and Lily were able to get a sneak peak at what was to come during the school year. This included exciting things such as learning the alphabet, the days of the week, the months of the year, how to tell time, and all about a variety of animals. These lessons are presented in a fun dynamic way. After their tour, Tad and Lily's minds were put at ease, as will your child's after watching this DVD. If your child has been preparing for school, then they will already know some of the lessons presented in the DVD. If they have been resisting learning any of those things, then this DVD might show them that they will be expected to learn such things outside of the home. It could also help encourage a child to apply themselves to learning these basic skills so they will be able to keep up with the rest of the class. You can find this DVD in the Lionsgate Shop and most places where children's educational DVDs are sold.